So many golfers, myself included, spend an inordinate amount of their time focussing on their swing. This search for mechanical excellence never seems to end for many of us when it is quite possible that many of us would be better off learning to play with what we have. 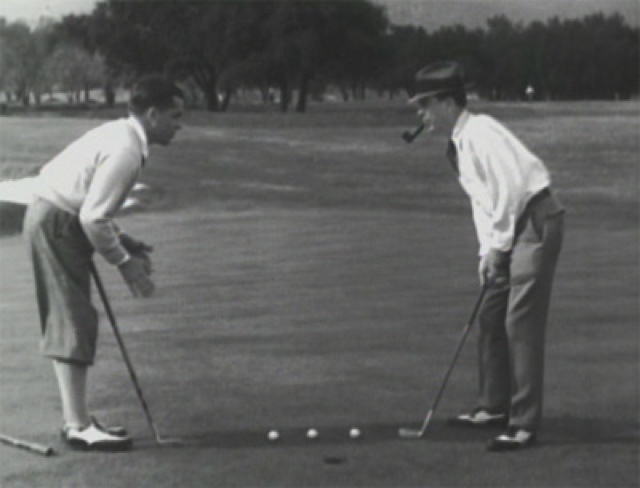 "It seems obvious to me that writing about the golf swing has become too technical and complicated, and even the most earnest teaching professional presents the game to his pupil as a far more difficult thing than it really is. It is equally obvious that what the game needs most if it is to grow in popularity is a simplification of teaching routines which will present a less formidable aspect to the beginner, and offer the average player a rosier prospect of improvement. The trouble could be, and I think it is, that golf is not taught as it is learned. It is taught more as a science or as a prescribed set of calisthenic exercises, whereas it is learned as a game." Today, we still see the vast majority of teachers focussing on helping golfers improve their golf swing, as though this was the way for them to improve as players. To some extent, I suppose, they are giving golfers what they think they want or need; namely a path to a sound, conventional golf swing. And Bobby said he would never discourage anyone from pursuing that goal with a qualified teacher. "It is folly for either teacher or pupil to expect that any swing can be perfected in an afternoon, a week, or even a season. It is significant that Stewart (Stewart Maiden, Bobby's teacher) did not try to fill my head with theories. He merely put me in a position to hit the ball and then told me to go on and hit it." "I have always said that I won more golf tournaments because I tried harder than anyone else and was willing to take more punishment than the others. More immodestly, I will say now that I think a large factor in my winning was a greater resourcefulness in coping with unusual situations and in recovering from or retrieving mistakes." Bobby credited his success to his ability to play the game, not on a perfect, repeating golf swing--something he believed was impossible to obtain. And I think teachers who really want to see their students improve would do well to emphasize the playing of the game over the swinging of the club. At every level we see golfers with unorthodox swings beating golfers with textbook swings. Why? Because they play the game better. While I am not a teacher, I have seen players I've attempted to help make improvements in their game by working, not on their swings, but on course management, learning to play bunker shots, and choosing the right clubs and shots when they find themselves in trouble, or when they are around the green. Golf is a game. It is best learned, as Bobby Jones said, by playing it. One of the great things about golf is the people you meet. The game is all-consuming when you are playing it; so, for four hours or so, you can forget your troubles and just worry about making the damned ball behave. You are generally playing in pleasant surroundings, with birds and various critters sharing the park-like setting with you. But it's the people you meet in your golf travels that really makes it special. 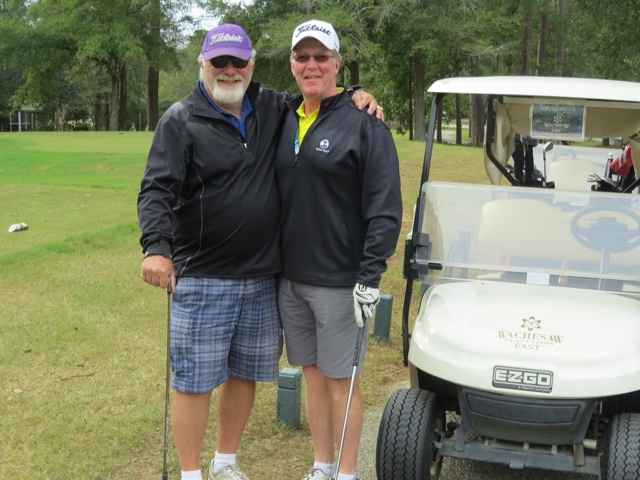 This week I arrived in Murrells Inlet, SC and, as a single, was lucky enough to be paired up with Richie and his nephew, Henry, at Indian Wells; and with Mike, from Cornwall, Ontario, at Wachesaw Plantation East. 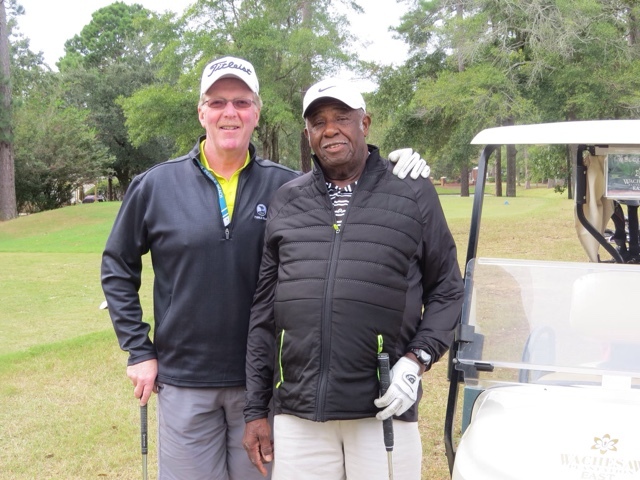 Richie is 81 and claims he played at a six when he kept a handicap. He drove it by me all day and had all the shots, and confessed that he made a lot of money playing as a six. I know I wouldn't have wanted any of his action. 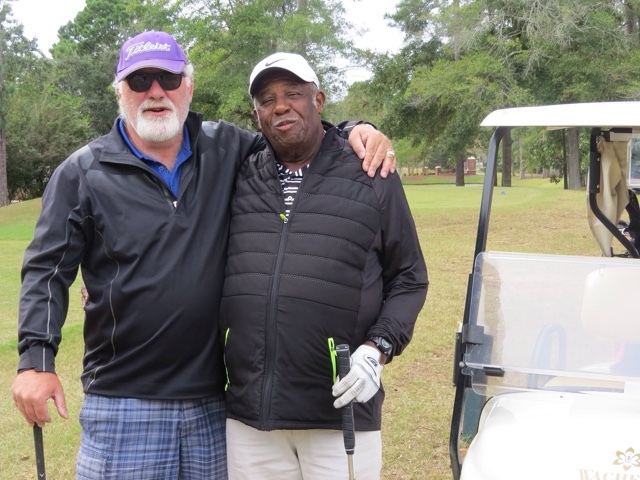 Henry struggled a little with his game, but was also great company on the course. Mike is a five and, at 62, still bombs it. 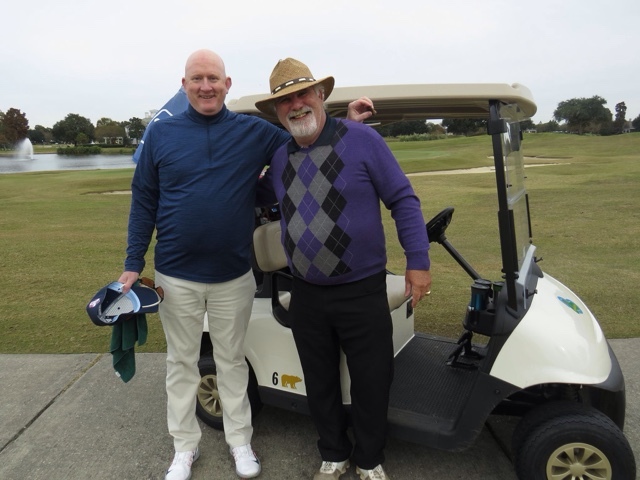 We played the senior tees and he generally had little more than a flip wedge to the par fours. The first time we played at Wachesaw he shot 73 with a double on the last hole. I shot 43 on the first nine, so my 35 coming in did little to prevent me from being thoroughly whipped. Today I managed to arrange a skins game with Richie and Mike. Henry had to leave for Virginia. Richie and I played the senior tees at just shy of 6000 yards, while Mike had to play the whites at 6300. After nine holes, we each had one skin. Mike and I won ours with birdies, while Richie won his with a par on the tricky third. Richie went out in 39. Mike and I were one shot better. Mike announced on ten tee that it was now "game on," and wasted no time in winning another skin with an impressive birdie from the right trees. I birdied 12 and 14 for two skins. Mike made par on 15 for a skin after Richie and I failed to get it up and down from the apron. I won another skin on 16 with a par and headed to 18 with a one skin lead. Eighteen at Wachesaw is rated as the second or third toughest finishing hole on the Myrtle Beach grand strand. It's a beast. But as luck would have it the senior tees were about fifty yards ahead of the whites today. Mike hit a perfect drive, right in the middle of the fairway, that, unfortunately for him, had about two yards of roll. He was left with about 160 yards into the wind. Richie and I hit good drives leaving me about 120 yards and Richies about ten yards less. and breaking left to right. Anyway, I stood over the putt and announced to the boys that I just needed to hit a solid putt. Sure enough, it went straight in the hole for birdie. I never birdie 18. Oh, I birdied it once by chipping one in, but birdies are few and far between on that hole. It was a great day with two really nice guys and two pretty damned good players. Mike shot 75 and hit the pin twice without the ball going in. Richie shot 79, breaking his age again. Something that was obviously no big deal to him, given how solid a player he is. I managed a 73. I've shot 73 at Wachesaw atleast half a dozen times. But I can never seem to shoot par on this track. We're scheduled to play again tomorrow if the weatherman is wrong about the projected thunder storms. 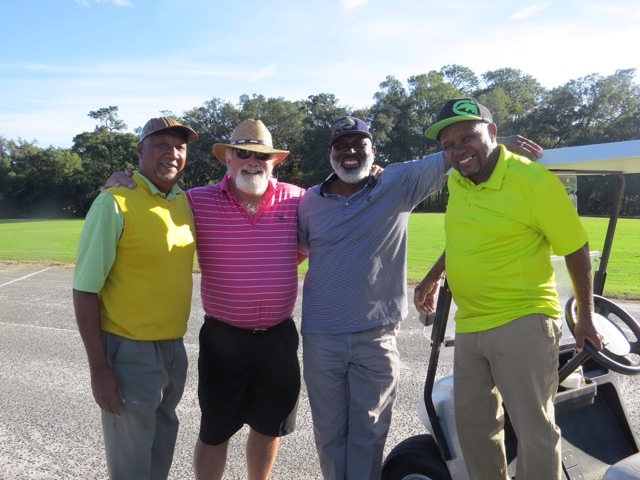 The great thing about golf is the people you meet. At our course, we don't really have a driving range. We have a tee box where you can hit as much as a seven or eight iron to some patchy ground with a couple of markers; but that's pretty much it. We have a small practice green where it's hard to find anything close to a straight putt. But at least you have a view of the lake. Ours is not really a club for those who love to practise. 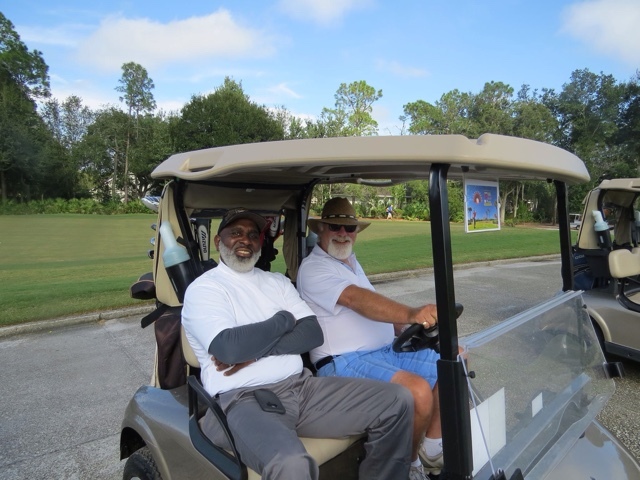 We all generally head from the car to the first tee wondering what we've brought that day. We might hit a few practice putts, and maybe even a few chips, prior to teeing off. But that's about it. Funny, when we go elsewhere to play, or compete, we often have the opportunity to hit balls first. But I'm not sure it helps an old cripple like me. I'm usually aching before I tee off if I do. So I prefer to just focus on trying to find the best way I can to get the damned ball in the hole. I just arrived in Murrells Inlet last night. Bright and early this morning, I was on the porch enjoying a coffee and my pipe, and watching two guys get ready to play. 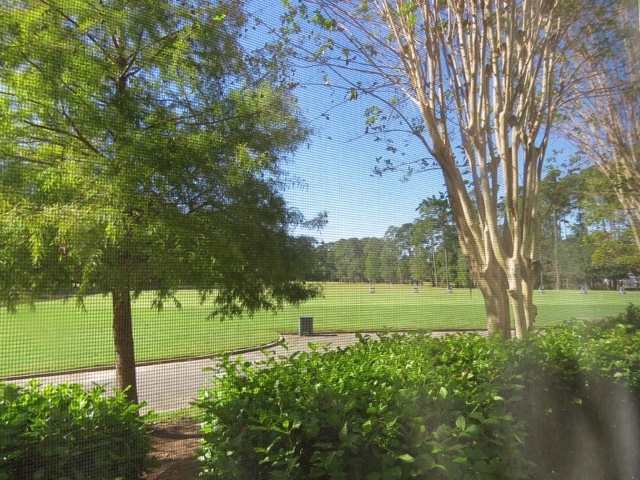 My porch overlooks the practice tee and the practice putting green at Wachesaw East. It's a really good course that hosted an LPGA event for a number of years. One of the guys headed to the practice tee and hit one shot after another, with barely a pause before raking another ball over and whacking it. He was done in about seven minutes and announced to the other guy, who was on the putting green, that he hadn't hit one decent shot. The other guy had started putting four footers; making the lion's share of them. Then he practised hitting lag putts; putting them all out. And finally he hit some chips and pitches before heading to the first tee. It looked to me like he had a really decent short game. And he seemed calm and ready to play. I don't know about you; but I'd have been willing to put a fairly substantial wager on the guy with the short game. But, who knows, maybe the rapid-fire guy can putt like a demon. In the end, it really is all about who can get it in the hole in the fewest number of strokes.